Beautifully glazed salmon on a bed of simple spinach salad. Only 478 calories per serving. 1. Stir together first 6 ingredients in a small saucepan. Bring to a boil; reduce heat, and simmer, uncovered, 15 minutes or until reduced by half. Pour mango mixture through a wire-mesh strainer; discard solids. Return mango mixture to saucepan; keep warm. 2. 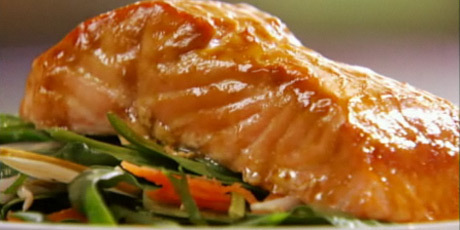 Place salmon on a rack in a broiler pan coated with cooking spray. Broil 5 1/2 inches from heat 5 minutes. Brush fish with 1/2 mango mixture. Broil 3 more minutes or until fish flakes with a fork. Spoon remaining mango glaze evenly over fish. 1. Chop the spinach rough cut, thinly slice the bosc pear into thin strips, shred the carrots on a grater, add bean sprouts, toss in sliced almonds if desired. Lightly toss the ingredients all together in a mixing bowl with the dressing. Remember easy on the dressing! 1. Place the Salad in a clean white soup like bowl, Use a fish spatula to place the salmon on top of the salad bed. Gently top with optional garnish.